A Toronto photographer tracked the same addresses over four decades to tell his city's changing story. Toronto-based photographer Patrick Cummins has worked as an archivist for the City of Toronto since 1986, specializing in photographic, cartographic, and architectural records. It's a combination of skills that has fittingly led to a new book. Written by Shawn Micallef (co-owner of Canadian urbanism magazine Spacing), Full Frontal T.O. features Cummins's extensive photography collection, telling the story of Toronto's dramatic transformation through its changing buildings. Cummins's photographic style is straightforward, giving readers an honest view of his built subjects without exaggerating any aspect of their progressions. We chatted with Cummins about his creative endeavor as well as the changes his city has seen. How and when did you first come up with this project? I began to photograph aspects of Toronto's streets when I moved here to attend art school in the late 1970s. I had discovered the work of Walker Evans and Eugene Atget and I was interested in documenting various older building types that I was seeing on the streets of Toronto in far greater numbers than I had grown up with in my native Georgetown, Ontario. In many ways, Toronto seemed to be a much larger version of the small town that I grew up in, with that town's Main Street, its residential sections and its industrial areas all enlarged and multiplied. It wasn't until 1988, however, that my typologies and comparative studies project got underway in earnest. I realized at that time that I had been shooting the same types of structures throughout the city, and that in some cases I had been re-shooting some of these structures at different points in time, documenting very drastic changes in some and rather subtle changes in others, and I decided to look at ways in which I could expand upon it in the form of a full-fledged project. What is the significance of your focus on smaller-scale, relatively anonymous buildings? My focus on the commonplace was based on my affinity for it and my discovery of the work of Evans and Atget and others who have followed in their footsteps in celebrating the everyday urban vernacular. In Toronto, there are vast neighborhoods of late 19th century, early 20th century structures, utilitarian, not very ornamental examples of the architectural styles of their day- none of which were ever really built to last, and very few of which will survive this century. So far, they have withstood the test of time, servicing several generations of Torontonians, outliving many of the grander, more celebrated examples of the same styles and eras. My interest has always been to celebrate these more utilitarian, anonymous structures that make up such a large part of the urban fabric, and that have been the homes and workplaces of so many residents of this city, documenting representative examples of them, over time, capturing the ways in which they change throughout the decades. Were there changes that caught you off guard as you put this book together? Not so much changes as much as fortuitous accidents that led to perhaps more interesting comparisons between some structures than between others. 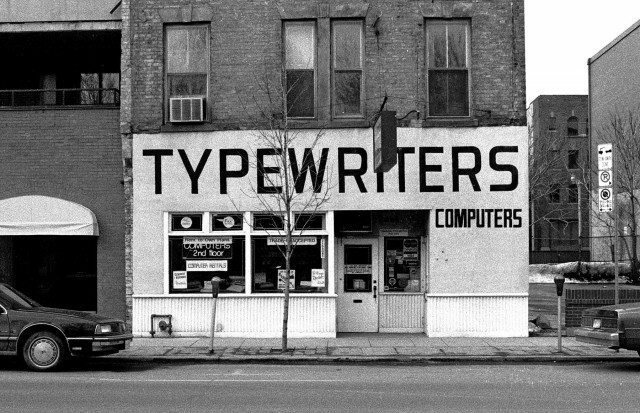 Such as when the store that advertised 'Typewriters' in large letters with 'Computers' below it in small letters reversed its signage to read 'Computers' in large letters and 'Typewriters' in small. Or when I discovered that the blinds on the 2nd storey windows of one structure had stayed in the same crooked position untouched for more than 15 years as evidenced in my photographs of it. 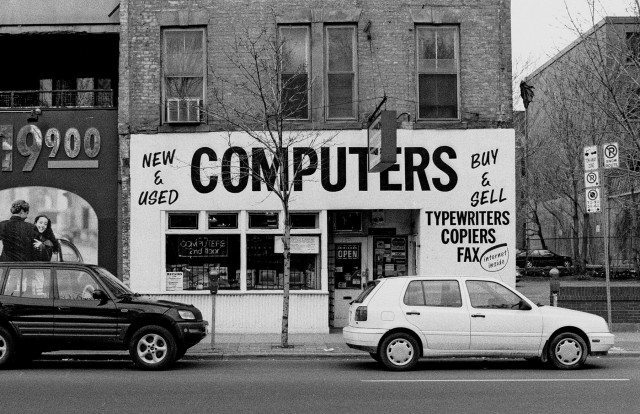 What has changed in Toronto since you began photographing it? Are there things you miss about the Toronto that existed when you started? The obvious choice here is Queen Street West. It was the central focus of my photography when I started and it continues to play an important role today. When I first started, this commercial street still bore a lot of evidence of past eras and usages, alongside its emerging gentrified sections. It still wore its history on its surfaces alongside the new. It was a mixture of the rough and the polished. Over the years, however, much of this evidence of the past has been eroded or erased. Although there's still a healthy enough D.I.Y. ethic present, there has been a tremendous boom in activity as the gentrification process continues its relentless march westward, unifying the streetscape, as new building facades replace old ones, or new buildings replace old ones altogether, causing vast changes. Another big change that's occurred has been the complete erasure and/or re-writing of the city's late 19th, early 20th century industrial landscape, with the loss of the industry to the suburbs, and then a later shift from the loft living/working that had taken over in the vacated spaces in the 1980s to the condominium explosion of today that has seen these spaces get remade as new housing or demolished outright for new developments. What changes do you anticipate in Toronto for a hypothetical 2020 update? For my project, there will be less of the specific structures around that I've been photographing from the beginning. Hopefully, however, I will have laid enough groundwork to keep carrying the project forward for some time! I think the total re-writing of the industrial parts of downtown Toronto will have continued to run its course and will be approaching completion. The kind of gentrification associated with Queen Street West has already begun on other commercial stretches and will continue to alter the look of our streets, and I think we will continue to see an increasing encroachment of new housing in older residential areas as the housing stock reaches the limits of its viability, be it structural or economic. Full Frontal T.O. is published by Coach House Books and was released earlier this month. It can be purchased in select bookstores, Amazon, or through the publishing company's website.